On July 27, 2004, Obama gave the Keynote Address at the Democratic National Convention at Boston, Massachusetts. In this speech, Obama recommended John Kerry for president and John Edwards for vice president. This speech made Obama famous, and a potential 2008 presidential candidate. On January 8, 2008, Obama spoke after the New Hampshire primary. His remarks are also known as the Yes, We Can speech. 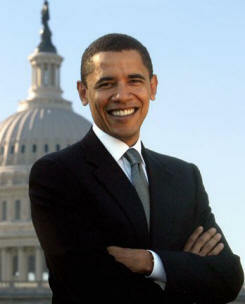 Former Illinois Senator (2005-2008) Obama became the 44th president of the United States. On January 20, 2009, Obama delivered his Inaugural Address. Also in 2009, he received the Nobel Prize for Peace. On May 1, 2011, at 11:35 p.m., Barack Obama addressed the Nation to announce that the United States has killed Osama bin Laden, the leader of al Qaeda. Here you can read and watch President Obama's speech On the Death of Osama bin Laden. On January 21, 2013, President Barack Obama delivered his Second Inaugural Address at the fifty-seventh inaugural ceremonies. And: See also the American Timeline.